Casio announces the next step in the CDP-S Series pianos. Introducing the CDP-S100, the perfect entry piano for anyone looking for the best portable keyboard experience. The CDP-S100 is smaller and lighter than most other competing keyboards, making transpiration a breeze. 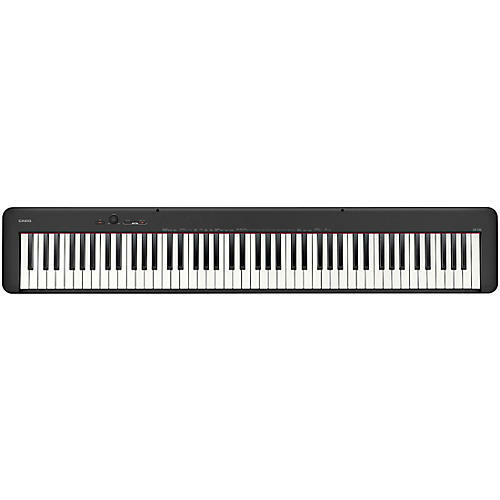 The proprietary Casio scaled hammer action keybed and beautiful grand piano sounds will keep you playing for hours. With Bluetooth connectivity and a free iOS application for extended control and features, the CDP-S100 is ready for practice and performance that’s on par with every other piano in its class. The most notable improvement of the CDP-S100 is the newly designed scaled hammer action keyboard with precise key weighting on each of the 88 keys. The result is a natural-responding keybed that adds to the expressive playability of the piano. Each key also benefits from a synthetic ivory and ebony surface that further adds to the realism of the piano. And you’ll want to get your hands on it as soon as you hear the stereo grand and nine additional built-in Tones. There’s also adjustable reverb and chorus settings to further shape your sound. To get the most out of the CDP-S100, you’ll want to pair it with the free Chordana Play app that gives you direct access to all piano functions and a play-along feature with over 200 songs built in. The Chordana Play app is also the perfect companion to dive deeper inside the control of the CDP-S100. Inside the app is a remote for the piano with control of various functions, the ability to save settings, and sync control between the app and compatible devices. The real fun is in the Chordana Player feature where you can play along with over 200 songs with a waterfall MIDI style view that teaches you what keys to play and when. You also have the ability to change the tempo if you want to slow things down for easier learning, or you can transpose the entire song up or down by one octave.